We went to Good Friday Service at a friend’s church this year. It was a truly moving experience. The program (I don’t like that word, but I don’t have a better one) was called “Stained“. We entered into a dimly lit church filled with tiny glowing candles. In the middle of it all was a very large, wooden cross, drapped with a pure while cloth. 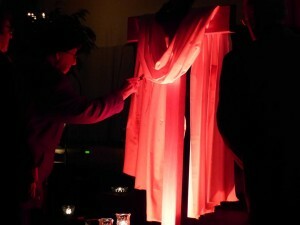 The cross and the cloth, were both bathed with a red light. To each side of the Cross was a small table – each covered with tiny candles, and just past that was a table holding the communion bread and grapes. 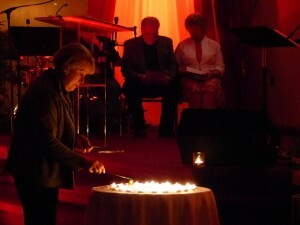 The service was a mix of wonderful music and thought-provoking words. It was quite somber and moving. What struck me the most was when we were all asked to come forward – if we wanted – and to stain that pure white cloth with red paint. I sat there for a while and just pondered all that it meant. I know that it meant the stains that I had in my life… my wrongs… my sins. To see all those stains being added. What I saw was people who willingly were going forward, but when they approached the cloth… well… some would make just a tiny mark – a dab – of paint. Almost as if they were ashamed of defiling the cloth. Others would make a mark on the cloth, but wanting to hide it from view as they placed their stain down low on the cloth, or in a place not so readily visible. A few did, in fact, add their stain to the top and “shoulder” of the cloth. Some placed small stains, some placed large stains. We then moved to a table filled with lit tea light candles and were asked to extinguish one to represent how Jesus – the Light of the World – was himself extinguished for our sins. The final stop was a communion station where we took a piece of bread and an actual grape to reinforce the body of Christ broken for us and how Jesus was crushed for our iniquities. My thoughts as I waited my turn to take my stains to the Cross… I don’t think there’s enough paint the bucket for my stains. But nonetheless, I made my mark on the pure white cloth. That experience stayed with me over the entire Easter weekend. You see, there really isn’t enough paint to cover all my sins. However, I know that when He was nailed to the Cross, He took my sins. I know that I am washed clean in the blood of Jesus. Some years ago, I wrote a story called “Scarlet Letters”… I am posting it again for you. If you find yourself in the list that follows… I beg you to cry out to Jesus. Confess that sin and let Him heal you…. Let Him into your heart, let Him redeem you. Let the blood He shed on that Cross cleanse you. Let that blood, wash away your sins. You are HIS, and He is waiting for you. As a young girl, I remember reading the “Scarlet Letter” by Nathaniel Hawthorne. We all know about Hester Prynne and her sin of adultery exposed by the birth of her illegitimate child, Pearl. Her sin was self-evident by the child she carried in her arms, but it was made more evident by the scarlet letter “A” that she was forced to wear on her chest, a public display of her sin. The reader goes on to learn about Dimmsdale and his own scarlet letter that he branded onto his own chest and the anguish of his own sin that eventually takes over his life causing such turmoil and distress on his physical health until he is eventually destroyed by his guilt. There is a darkness that envelops the soul of a sinner, darkness so thick with doom and dread that it begins to suffocate the sinner. The weight of carrying the burden; the mock and the scorn of the sin eventually destroys the sinner to the point that they feel that there is no forgiveness for them; they are doomed to wear that letter forever. Whatever the letter that either we chose to burn into our own chest, or one that society chooses to brand us with, we can step out of the darkness in our soul and walk in forgiveness. Over and over again in the Scriptures, we see the signs of mercy and forgiveness of our sins. More than two thousand years ago, God sent His son to this earth in the form of a man. God sent this man, Jesus, as a spotless lamb to be sacrificed for our sins. This wholly blameless man stood silent as He was mocked and scorned and beaten and bloodied for our sins. He gathered our sins in His hands and without a sound He laid down on that cross to be crucified for us. With each blow of the hammer onto the nails that would hold him to the cross, our sins were forgiven. He took those sins, our sins, with Him that we may have forgiveness. Jesus took those sins so that we may be redeemed in Him, that we may be sanctified through Him, that we may be justified with Him, that we may know the forgiveness of our sins from the Heavenly Throne of God. 9 He will not constantly accuse us, nor remain angry forever. 10 He does not punish us for all our sins; he does not deal harshly with us, as we deserve. 12 He has removed our sins as far from us as the east is from the west. It is we, the sinner that chooses to carry our sins in us as a scarlet letter, burned into our flesh. Carrying that sin with us, once we have repented to God for that sin, makes us into mockers of the Cross. Perhaps it our refusal to accept God’s forgiveness, perhaps it is our lack of self-worth that we can’t accept God’s forgiveness. After all, how could God ever forgive me? Why would God ever forgive me? How could God forgive you? Because He is God, because when you repent, and turn away from that sin and seek His face you are forgiven. All He is waiting for is for you to take that first step towards Him. Why would God forgive you? Because of His infinite love for you. Because you are His chosen one. Because He has called you out of the darkness of your sin, to walk in His light. He wants to raise you out of the muck and mire that has enveloped your life. He wants you to walk as a child of the King. Now is your time to seek His face.